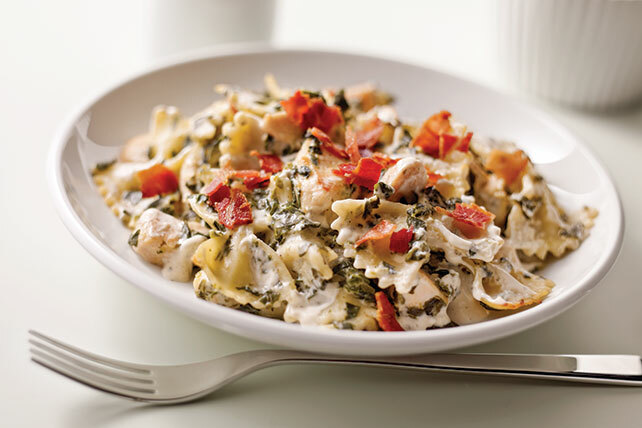 Get everything you love about chicken Florentine in one easy Baked Chicken Casserole. Topped with crumbled bacon, our Baked Chicken Casserole is delicious! Mix cream cheese spread, 2 Tbsp. milk and seasoning until blended. Heat oil in large nonstick skillet on medium heat. Add chicken and garlic; cook and stir 6 to 7 min. or until chicken is done. Stir in cream cheese mixture and all remaining ingredients except bacon. Spoon into 1-1/2-qt. casserole sprayed with cooking spray; cover. Bake 10 min. Top with bacon; bake, uncovered, 15 min. or until casserole is heated through. Substitute 1 can (14 oz.) artichoke hearts, drained and chopped, for the spinach.